With all of our gizmos and gadgets, our social media accounts and multiple email addresses, we clutter our communication channels and find ourselves engaging in meaningful conversations... far less. At the core of every single meaningful human relationship is meaningful conversation. With tech-clutter, it's hard. At timslatter.com, we've developed our services around helping our clients stay in touch with their clients. With our focus on Public Relations, we help our clients create, build and sustain mutually beneficial relationships with their stakeholders - through online reputation management. 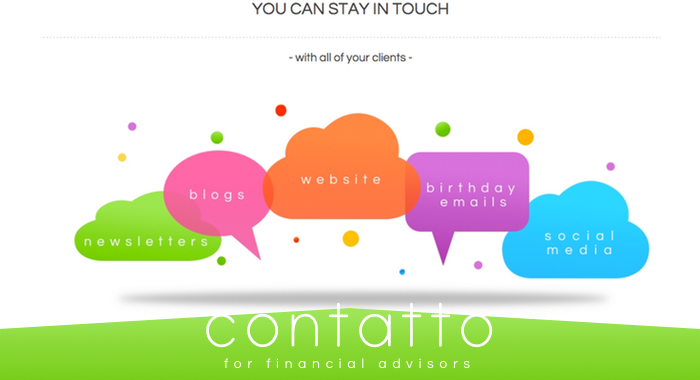 Contatto is one of our services that is uniquely tailored for financial advisors and financial planners. The financial planning industry is one that is built solidly on personal referrals and commendations. Most of the time, someone will choose their financial advisor based on the advice and choices of their friends. Are your clients hearing from you enough? Do they feel like the information you're giving them is valuable enough to stick with you? Do they know how to contact you when they need to? If you have doubts to any of these questions, perhaps you could be using your online identity with more veracity and lucidity.